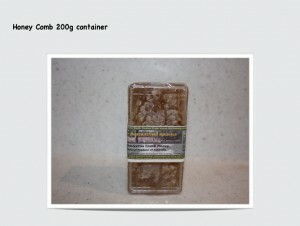 We have pure honeycomb pieces or sections available in containers. Honeycomb production involves a lot of energy expenditure by our bees because the wax they make and the honey stored in it are harvested. When honey alone is extracted, the beeswax combs in the frames are returned to the hive for refilling so that the bees do not need to make more wax. It takes the bees 9 kg of honey to make 1 kg of beeswax, so you can see that the honeycomb sections involve enormous work by the bees and so are more expensive than buying honey alone. The honeycomb can be eaten by chewing pieces of it or spreading it on toast or many other ways. Some people choose to swallow the wax whilst others chew on it to extract the honey and remove the wax from their mouths. It is used as a source of immediate energy for athletes. A 200 gram container of pure honeycomb direct from our bees is $10.